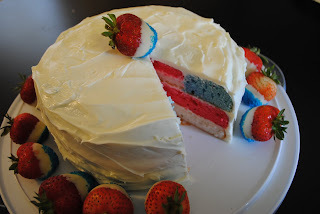 Last week while poking around the good old interweb I found a 4th of July cake on 17 and baking and said to myself "Self, this intricate cake looks like something that could really frustrate you, why not try to make it this weekend." And so it was. On this fine weekend of independence celebration I, being the dedicated employee that I am, scheduled myself to work on Saturday. With that, I knew that I was going to avoid the imminent hangover that Friday night trivia usually assures and I would be fully capable of actually accomplishing something on Saturday after finishing with work. With rain in the forecast for all of Saturday, this little cake seemed to be the perfect accomplishment to tackle. 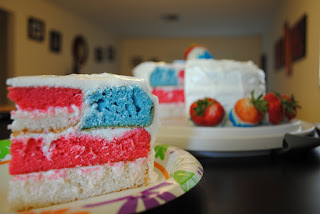 I essentially used 2 cake mix's and made Three 8 inch round cakes (1 red, 1 white, and 1 blue, made by a little food coloring added to vanilla cake) and two 4 inch round cakes (1 red and 1 white). My blue layer was a bit thicker, which makes more sense below. Start with the 8 inch white then the 8 Inch red with a layer of icing in-between. Then put on your fav icing. I used cream cheese because it's yummo. 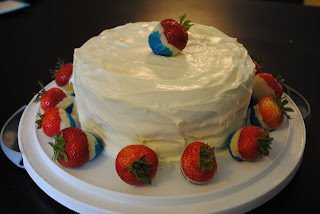 To make the outside of the cake look as freedom filled as the inside I added strawberries which were dipped in white chocolate and blue sugar sprinkles. Bask in your creativeness and Enjoy! 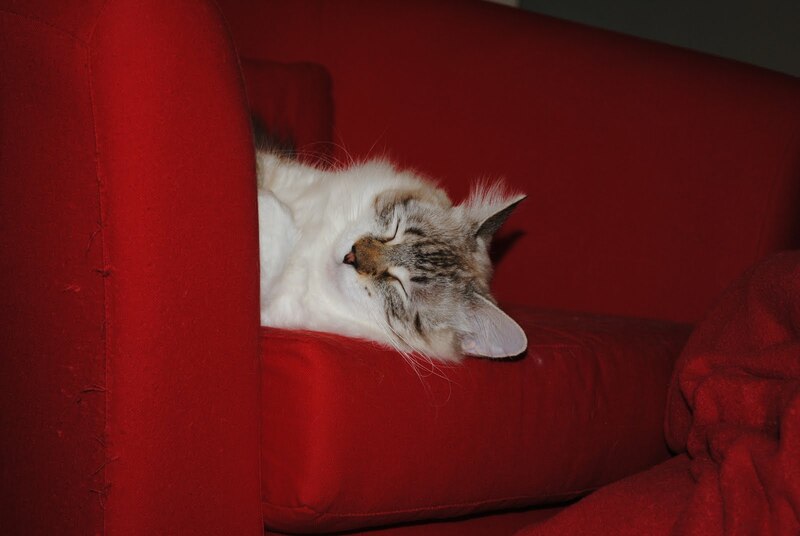 Last but certainly not least, have a nap, you worked really hard. Can I get an H! Where was this game when I was a kid?